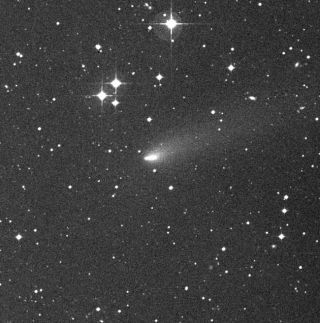 Discovery image of Comet Hartley 2, which Malcolm Hartley found in 1986. As a NASA spacecraft speeds towardits rendezvous tomorrow(Nov. 4) with Comet Hartley 2, the icy wanderer is putting on a show,blastingout gassy jets and coughing up loads of poisonous cyanide. In less than 24 hours, the DeepImpact probe will cruise towithin 435 miles (700 kilometers) of Hartley 2, marking just the fifthtimethat a comet has ever been observed up close. And the view should beinteresting. "We're about to be surprised," saidMike A'Hearnof the University of Maryland, principal investigator of Deep Impact'smission,which NASA calls EPOXI. "This comet is unlike any we've visited before,and we don't know what we're going to find." The Deep Impact spacecraft has beenchasing Hartley 2 formonths, taking pictures and maneuvering to prepare for the close flyby,whichis scheduled to take place at 10:01 a.m. EDT (1601 GMT) on Nov. 4. Later this evening (Nov. 3), about 18hours before its closestapproach, Deep Impact will begin the encounter phase of its mission.The probewill reorient itself so its three imagers ? two in the visible-lightspectrumand one in the infrared ? can lock on Comet Hartley 2 for the next 24hours-plus. This maneuver will point the probe'shigh-gain antenna awayfrom Earth, meaning Deep Impact won't be able to beam pictures home fora bit,researchers said. Instead, it will store the photos onboard in its twocomputers. This lack of multitasking abilityreflects the fact thatDeep Impact is a recycled, repurposed spacecraft. It was originallydesigned toserve as a mother ship for NASA's Deep Impact mission, whichintentionally crasheda probe into Comet Tempel 1 in 2005 to study the object'scomposition. Soon after Deep Impact's closestapproach with Hartley 2,mission scientists will reorient the probe so it can both track thenow-receding comet and start beaming images to Earth. The spacecraft will continue to takenew photos while itsends its cache of comet close-ups home. The first few photos shouldreachresearchers' computers about an hour or so after the rendezvous,scientistssaid. The complete data dump, however, will take a while. Researchers should get some goodlooks at Comet Hartley 2.One of Deep Impact's cameras is so powerful that it can distinguish thesizedifference between a car and a pickup truck from 400 miles (645 km)away,mission scientists have said. Data from the close approach willcontinue to downloadthrough Saturday (Nov. 6) but NASA will release preliminary resultssooner thanthat. A news conference is scheduled for 4 p.m. EDT (2200 GMT) tomorrow(Nov.4), just six hours after Deep Impact's closest approach to Hartley 2,agencyofficials said. Though Deep Impact will zoom by CometHartley 2 incrediblyfast during the flyby ? at about 27,000 mph (43,548 kph) ? thespacecraft willbe able to track the comet's tail end with just a slow swivel. Theprobe willturn about 1 degree per second, according to mission scientists ?one-sixth therate at which a second hand makes its way around a clock face. This anticipated ease of tracking isone reason missionplanners chose to stay 700 kilometers away from the comet, rather thanzip infor a closer, more detailed look. Another reason: to keep Deep Impactaway from the densestparts of Hartley 2's coma, the gassy, dusty cloud around its nucleus.Particlesin the coma could damage Deep Impact's antenna if the probe gets tooclose. "We've chosen 700 kilometers becausewe're balancingseveral desires and several threats here," explained EPOXI projectmanagerTim Larson, of NASA's Jet Propulsion Laboratory. Deep Impact will continuephotographing Hartley 2 for aboutthree weeks as the comet speeds off into the dark reaches of space,Larsonadded. After that point, the spacecraft's comet-watching mission willbe basicallyover. Researchers hope Deep Impact's flybypast Hartley 2 can givethem a good idea of the composition of the comet's icy nucleus. Theyare alsoeager to compare Hartley 2 to the four other comets that spacecrafthavevisited in the past. Hartley 2, while just under a mile(1.5 km) across, isincredibly active. A close study of its spewing jets and gas cloudscould yieldclues about comet composition and behavior in general, researchers said. "We saw outbursts in Comet Tempel 1,as well as manyother things," A'hearn said. "We're trying to find out, are all ofthe new phenomena we saw at Tempel 1 universal across all comets, orare theyspecial to Comet Tempel 1?" Comets are leftovers from the solarsystem's formation 4.5 billion years ago, so studying themshould giveastronomers a better handle on how our cosmic neighborhood came to be,researchers said. The 2005 kamikaze crash into Tempel 1exposed whatscientists think are primordial layers of matter dating back 4.5billion years.EPOXI scientists hope an up-close look at Hartley 2 will reveal similarancientmaterial, perhaps providing key insights about our solar system's youth. "That's the ultimate goal at theencounter,"A'hearn said.